A council chief said the meeting with a Government minister over the town’s financial future was positive. Councillor Christopher Akers-Belcher, the leader of the council, was joined by council chief executive Gill Alexander and town MP Iain Wright for a meeting with Greg Clark, the Secretary of State for Local Government. 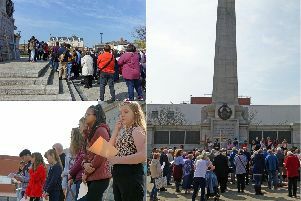 The meeting was arranged as a call for help after an annual £3.9million cut in the power plant’s business rates payable to Hartlepool Borough Council. Coun Akers-Belcher said: “We had a really positive meeting with the Minister and he fully understood the scale of the problem we face in relation to the year-on-year loss of almost £4m in business rates. “He listened attentively to what we had to say and did promise to explore a number of avenues to assist our financial plight. “We are not expecting a quick fix but we are hoping that if we continue to work constructively with the Minister, a solution can be found in the longer term that significantly reduces the financial risk of Hartlepool Power Station on the Council Tax payers of Hartlepool. The Hartlepool delegation also highlighted the risk to the council’s budget as changes in government policy mean local authorities will become increasingly dependent on business rates. The power station does not have to pay business rates during unplanned shutdowns as in 2014.